Ernesto Araújo is the conservative, nationalist, and anti-Marxist foreign minister of Brazil under President Jair Bolsonaro. Among other conservative positions, Araújo has spoken positively of U.S. President Donald Trump, Christian values, traditional values including the family and gender distinctions, and national sovereignty. He has strongly criticized globalism, Marxism (including cultural Marxism), and belief in human-caused climate change. He has also voiced those positions as foreign minister. 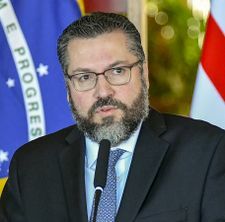 A career diplomat, Araújo was appointed Brazil's foreign minister by president-elect Jair Bolsonaro. Brazil’s diplomacy at risk of rupture with Araujo appointment. Breitbart News (from AFP). November 22, 2018. Retrieved February 23, 2019. Coletta, Ricardo Della (November 15, 2018). Ernesto Araújo, o chanceler contra o “marxismo cultural” que mira Trump. El País. Retrieved February 23, 2019. Brazil's new foreign minister says country will abandon globalism. Reuters. January 2, 2019. Retrieved January 2, 2019. Coletta, Ricardo Della (January 2, 2019). Ernesto Araújo estreia ‘olavismo’ no Itamaraty e dedica pouco espaço à pauta comercial. El País. Retrieved February 23, 2019. Araujo, Ernesto (January 7, 2019). Bolsonaro Was Not Elected to Take Brazil as He Found It. Bloomberg. Retrieved February 23, 2019. Jekielek, Jan (April 9, 2019). Brazil’s Foreign Minister on Renewing Ties With US, ‘Spiritual Dimension,’ and Political Labels. The Epoch Times. Retrieved April 11, 2019. This page was last modified on 11 April 2019, at 08:00.